Russian President Vladimir Putin visited the breakaway republic of Abkhazia and pledged to support its “stability and independence” on the anniversary of the outbreak of war with Georgia in 2008. The visit, on August 8, marked the ninth anniversary of Russia’s war with Georgia over another breakaway republic, South Ossetia. Shortly after the end of that five-day war, Russia recognized both Abkhazia and South Ossetia as independent states. Only a handful of countries have followed suit, and most of the rest of the world continues to regard the two entities as part of Georgia. Putin’s visit came just a week after United States Vice President Mike Pence visited Georgia, observed a joint U.S.-Georgia military exercise, and offered vocal support for Tbilisi’s struggle over Abkhazia. Putin’s visit was likely planned before Pence’s, but the Russian president no doubt relished the coincidence nevertheless, said Sergey Markedonov, a Caucasus expert at the Russian State University for the Humanities. “If this visit gives some grounds for talking about Russia’s response, Putin was glad – he’s happy to see his role as an obstacle to the U.S.,” Markedonov told EurasiaNet.org. The Georgian government, which held an event commemorating the Georgians killed during the 2008 war, condemned Putin’s visit. “Such cynical action at the 9th anniversary of the Russia-Georgia war serves for legitimization of forceful change of borders of the sovereign state through military aggression, ethnic cleansing and occupation. By this step, the Kremlin tries in vain to support and legitimize its occupation regimes,” Georgia’s foreign ministry said in a statement. 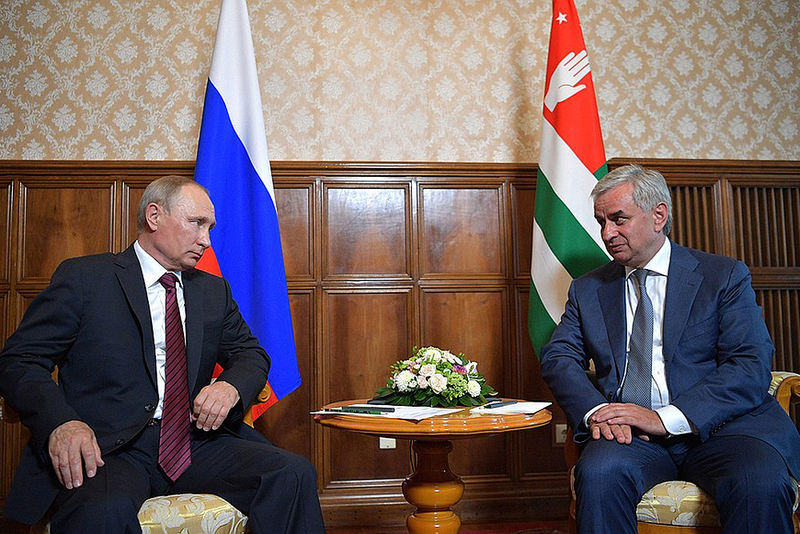 Putin is one of the relatively few Russians to be arriving in Abkhazia these days. On August 2, a massive explosion at an ammunition dump in the village of Primorskoe wounded 64 people and killed two tourists from Saint Petersburg. The news spooked Russians who had been planning to vacation in Abkhazia, resulting in “a massive wave of cancelations,” the head of the Abkhazia Tourism Union, Anna Kalyagina, told RIA Novosti. Joshua Kucera is the Turkey/Caucasus editor at EurasiaNet.org, and author of The Bug Pit. He is based in Istanbul.